Be the first to share your favorite memory, photo or story of John Patrick "Fiddy". This memorial page is dedicated for family, friends and future generations to celebrate the life of their loved one. 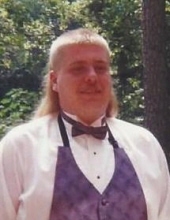 A Bardstown resident, John Patrick “Fiddy” Magee, age 42 passed away Tuesday, March 19, 2019 at his residence with his family by his side. He was born on October 23, 1976 in Louisville to Nancy Magee Morrell. Fiddy was a self employed mechanic, loved spending time outdoors, racing cars, rzrs, being with friends and family, and was of the catholic faith. He is survived by his son, Cameron Hester of Cox’s Creek, 2 daughters, Hannah Nicole Magee of Bardstown, Kerigan Magee of Chaplin, his mother, Nancy Magee Morrell of Bardstown, his sister, Julie (Ancil) Watson of Bardstown, grandchild, Jaxston Hester of Cox’s Creek, nieces, Adrian Watson, Harley Watson, and a great niece, Oakleigh Chowning all of Bardstown. A special uncle Butch Magee and nephew Noah Magee. Funeral services for Mr. John Patrick “Fiddy” Magee will be 11:00 am Friday, March 22, 2019 at the Houghlin-Greenwell Funeral Home, 1475 New Shepherdsville Road. Chaplain Jose Albovias Jr. will officiate. Interment will be in Bardstown Cemetery. Visitation will be Thursday from 11:00-8:00 pm. The Houghlin-Greenwell Funeral Home is in charge of arrangements. To send flowers or a remembrance gift to the family of John Patrick "Fiddy" Magee, please visit our Tribute Store. "Email Address" would like to share the life celebration of John Patrick "Fiddy" Magee. Click on the "link" to go to share a favorite memory or leave a condolence message for the family. memory of John Patrick "Fiddy"